Tsongmo Lake also called Changu Lake is a high altitude lake near Nathu La in Sikkim. Most people traveling to Nathu La consider stopping by at Tsomgo Lake on their way back. The lake, about 1 km long, remains frozen in the winter months and during summer months is surrounded by beautiful blooming flowers. The beauty of the lake is noticing the reflection of snow-covered mountains in the serene water of the lake, a truly mesmerizing experience. 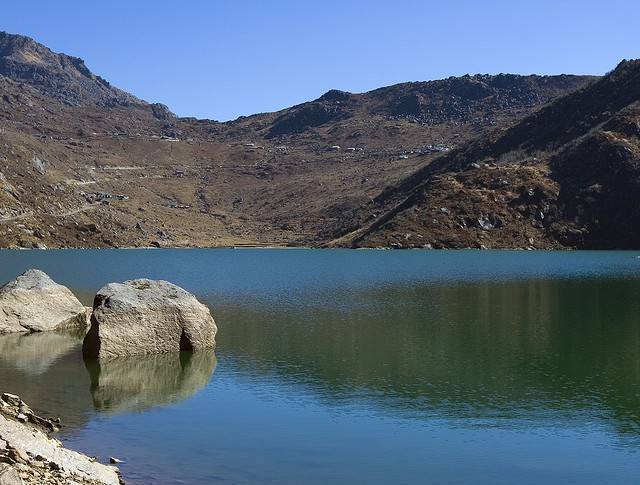 Tsongmo Lake is about 40 KMs from Gangtok. Baba Mandir on Indo-china border is another very famous attraction nearby. You wont find good options to eat here. Its best to carry eatables and water along.